Home Latest News Should Sports Direct Investors Worry Mike Ashley’s Lost His Touch? Mike Ashley, founder and CEO of Sports Direct, the UK’s largest sportswear retail chain and now a major holding with stakes in and ownership of assorted other retail operations and brands, has always divided opinion. A genuinely self-made billionaire, Ashley started out in 1982 with one small sports shop in Maidenhead, just outside of London, with a £10,000 loan from his family of modest means. He quickly grew it into a chain of over 100 stores spanning the UK but remarkably did so as a sole trader. The company wasn’t incorporated until 1999. 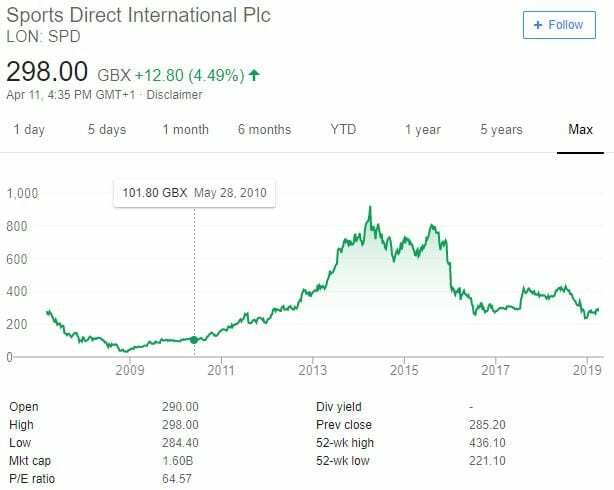 Sports Direct is now a FTSE 250 company with over 400 stores, an international presence and has stakes in other retailers from House of Fraser, Lillywhites, Blacks Leisure Group and direct, if more upmarket, competitors to Sports Direct – JJB Sports and JD Sports. But his real success, and money, has come from buying up well known brands that have run into financial trouble. Sports Direct has bought Dunlop Slazenger, outdoor gear brand and manufacturer Karrimor, Kangol and Lonsdale. He also has a stake and long term partnership with Umbro. There’s a lot of respect for the success he has made of himself and his company. He’s made a lot of money for early Sports Direct investors. Between late 2008 and early 2014, the Sports Direct share price rose from 32p to 922p. But recently things have gone less well for one of the UK’s most inaccessible businessmen (he barely ever speaks to the press or anyone else in public view). Since 2015 things have gone less well for Sports Direct and Ashley appears to have made several bad investment calls in a row. The latest and biggest is Debenhams, the department store Sports Direct owns a near 30% stake in. It’s fall into administration looks set to cost his company £150 million. He did make a bid to save Debenhams but the aggression of his terms, an approach to distressed companies he has built his fortune on, was this time too much and rejected. This time he pushed too hard and it will cost him and Sports Direct investors a lot of money instead of making it. And the wrong calls are now stacking up. Poorly performing stakes in Findel, Mysale and Goals Soccer Centres also look likely to cost the company another £50 million or so. Sports Direct also has a holding in French Connection. The fashion retailer, once an upper-mid price range staple of the UK’s high streets is also said to be struggling and Ashley’s share is presumed to be in the red. A heavy loss is also presumed on Iconix, the U.S. sporting brands business bought into last year and it’s hard to tell how interests in private companies such as House of Fraser, Evans Cycles and Sofa.com are doing. Ashley built his name and business with success on the high street, an aggressive approach to takeovers and not particularly caring what anyone in the City of London’s glass towers thought about him. With the high street failing in its traditional format, the question is whether Ashley can reinvent himself and Sports Direct. Or if his talents were perhaps suited to a time in retail that has now passed.